Downton Abbey has taken the both England and now America by storm, showing the lives of the wealthy Crawley family and their servants living in style in Downton Abbey. But it is not just the woes of having incredible amounts of money and mis-behaving family members that makes the show so popular, it is the amazing costumes, hair and make up that capture the attention of young women wishing they were Lady Mary! So now Caroline McCall has decided to cover up the cast (women of that time were normally a little more liberal with their clothing that the look that is portrayed in this series) some of the prettiest and most adorable costumes have been seen gracing the screen. This calls for a look back through the Donwton years to pick some of the best costume designs that help to make us just that little but more jealous of the ladies and their lavish lives. 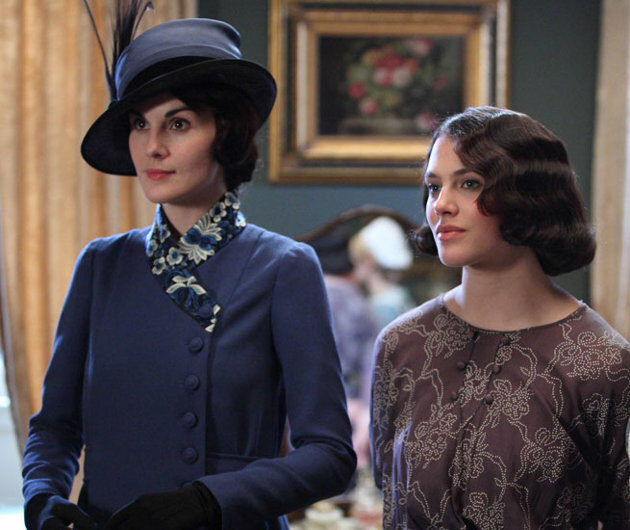 Now although I feel like Lady Mary could really have used a splashing of fake tan (Damn people for not inventing it sooner) she is by far my favourite member of the Crawley family - Both because of her amazing ice cold stare she uses to get anything she wants and of course because of the costumes she wears. Although this is a little bit Queen like, I love this. Who knew that the Carwley ladies could even be more ahead of the trends that Burberry for SS14!? Of course you can't look at Donwton Abbey costume and not look at possibly one of the best dresses seen in the history of Donwton....Lady Mary's WEDDING DRESS. So if you haven't been watching the latest series or if you haven't watched any at all, hopefully this has tickled your fashion loving taste buds into switching on and drooling over the amazing dresses and impeccable suit tailoring! Ah the days when ladies were real ladies soooo pretty !